Read on for the reaction of students on GCSE Results Day…. "I am over the moon with my results and my parents will be thrilled. It’s a relief that the anticipation is finally over, but also that all the hard work has paid off. I feel ready to move into the Sixth Form at Whitmore. Thank you to all the teachers who helped us through the courses and exams. I am excited to see what the future holds." 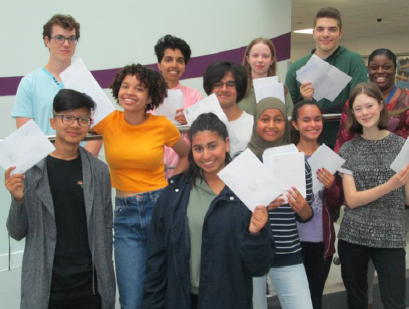 "I am incredibly pleased with my results; it took ages to open the envelope and find out what I had achieved … in fact a teacher finally opened it for me! If I were to advise high school students in Years 7, 8 and 9, it would be to begin revising early, as it will help in the marathon we call GCSEs." "Over the course of Year 11 my expectations fluctuated wildly; that being the case, I was ecstatic to open the envelope and see almost all grade 9s. What made a massive difference to me was my own willpower and determination to refrain from using my phone for three months prior to my exams. Oh, and the teachers were good too!" "I feel very overwhelmed and emotional. My amazing friends have given me a strong support system … and laughs when I was demotivated. I am optimistic about hard work opening future doors for me." "I was not expecting these results but I am incredibly proud; I owe it to my teachers who gave me lots of support and encouragement. I am planning to study A levels and pursue a career in Medicine." "It’s a huge relief knowing that, after a two-month wait, the grades I have achieved will allow me to follow my chosen A levels. I don’t know exactly what that will lead to, but I have so many options now." "I was thrilled when I got my results - I couldn’t believe these were MY grades! I would like to thank all my teachers for setting up revision sessions and for being helpful in answering all the questions I had. In the future I would love to pursue a career in Science, maybe Biochemistry." "I thought I had done badly after the exams, but I have achieved some of the best results in my year. It just goes to show that nothing is out of sight until the moment you stop trying. I am relieved that late night revision and a reduced social life have finally paid off. " "The moment I opened my results I was thrilled and overjoyed. My self-confidence has risen a huge amount …. the GCSE experience has been worthwhile and I am grateful to all the teachers who have helped all the students here at Whitmore." "I am very proud of my results, they have boosted my confidence for the future – not just in my A Level courses but in life generally. I would like to thank my parents for their loving support and keeping me on track; I would also like to thank my teachers who made school a warm place to come to, which has made all the difference."